This guide outlines all of the dialog screens presented in the QuanaStor web management interface and how to use them. This guide is also accessible within the QuantaStor web manager directly by pressing the question mark help button in the upper right hand corner of the web UI (?). Select a topic for more detail on a specific dialog or area of management. Note that for scripting and automation all operations presented via the QuantaStor web management interface are also accessible via the QuantaStor command line interface (CLI) tool (qs) and via REST APIs as outlined in the QuantaStor Developer Guide. The QuantaStor web administration interface is accessible via all major web browsers (Firefox, Chrome, Safari, Opera, & Internet Explorer) and has been developed in native HTML5 to be fast and responsive. After an appliance boots the text mode system console (also accessible via IPMI) will display the public facing IP addresses. On a new unconfigured system the first network port is assigned an IP address via DHCP. 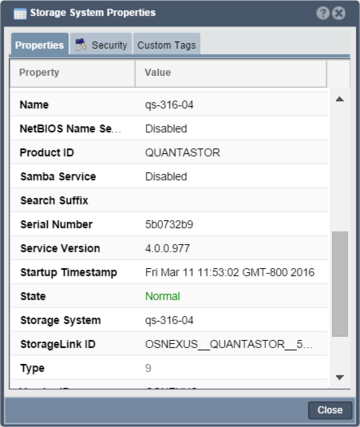 Simply select one of the assigned IP addresses and enter it as the address/URL inside your web browser to access the QuantaStor web administration interface. The Web Administration will support a secure connection when using https:// to connect. By default both types of connections are supported. 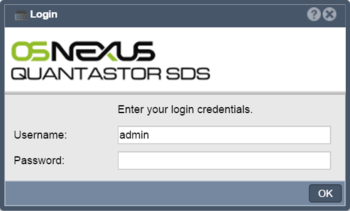 The default admin password for QuantaStor is simply 'password'. If you do not enter a password it will assume the default and will attempt to login to the system with 'password'. The administrator user name is simply 'admin'. It is recommended that you change the administrator password the first time you login to the system. If you are having trouble logging in, try hitting the reload button on your browser (Ctrl-F5) or clear your browser cache. Sometimes, especially after an upgrade one may need to clear the browser cache. The following guide provides details into the various dialog windows used to manage the QuantaStor system. Using the help button (found in the upper right hand corner of each dialog in the QuantaStor web administration interface) on you will be taken directly to the specific page for that dialog within the wiki or you can directly browse the documentation here through the following guide. Every item you see in the QuantaStor Manager web interface is internally stored as an 'object' in the scale-out grid management system. All objects have a name and a unique ID (UUID) and several other properties. As an example a Storage Volume is a block device and is accessible via iSCSI so 'iqn' is a property of the Storage Volume. Details like 'iqn' can be viewed via the Properties' pane on the right side of the manager screen or by right-clicking on the object and selecting Properties from the menu. The resulting Properties window also contains a Security tab and a Tags section for assigning user defined custom key/value pairs to objects. Within the security tab, administrators can choose to limit who has access to the particular object. All QuantaStor editions and product features are controlled by license key. If you have a system deployment that requires additional features or capacity your system can be expanded by adding an expansion license to your existing system license. When you add a new license you must activate it within one week after adding it or it will be deactivated. To activate your license simply choose the 'Activate Online' option. Alternatively, if your system does not have internet access you can use the 'Activate via Email' option. These core system configuration dialogs include most of the key administrative operations use to initially configure, upgrade, and maintain your system. QuantaStor has a broad set of network management features including bonding/teaming, virtual interfaces and VLANs. QuantaStor supports the use of both hardware RAID and software RAID. When used together it provides many advantages both in terms of performance and ease of maintenance. Integrated hardware management modules are built into QuantaStor for LSI MegaRAID, Adaptec, HP SmartArray, Dell PERC, and other controllers. Please see our HCL for a full list of which adapters have integrated hardware management support. Hard disk drives of all types including SAS, SATA, and SSD appear to your QuantaStor appliance as disks. Although we use the term physical disk, in cases where hardware RAID is used the physical disk drives are actually logical drives (aka RAID units / virtual disks) coming from the hardware RAID controller. QuantaStor can also be configured to use virtual disks as storage when deployed as a virtual appliance and can also use storage devices from other storage systems when configured as a gateway appliance. A storage pool is a logical grouping of disks into a pool from which volumes (LUNs) and network shares can be provisioned. QuantaStor has support for ZFS, and XFS based storage pools. ZFS based storage pools are the most powerful and the most versatile but XFS based storage pools have some performance advantages for some applications. One a pool is provisioned you can provision storage volumes and network shares using available space in the storage pool. Network shares provide network attached storage (NAS) capabilities. Each network share is provisioned from a specific storage pool so you must first create a pool of storage before provisioning shares. Once created you can control NFS and CIFS access to network shares. Network Shares Namespaces use Microsoft DFS and NFSv4 referrals to provide global namespace capabilities across the grid. Storage volumes (LUNs) are block devices which are made accessible via the iSCSI and/or FibreChannel protocols. Each storage volume is provisioned from a specific Storage Pool on a specific node within a grid of systems. In order to make a storage volume accessible to a host you must first add a Host to the system, then assign the storage to it. Storage volume groups provide a easy way to keep track of volumes when multiple are assigned or utilized for the same host. In cases where the volumes in a group reside within an Advanced storage pool you can also create snapshots of volume groups. Snapshot schedules can be created to make instant snapshots of volumes for quick and easy recovery and rollback of data. To take advantage of Snapshots you must create a Storage Pool based on the ZFS filesystem which is the default. A host entry must be added for each host that you want to assign storage volumes to. The host entry stores one or more initiator IDs which can include one or more FC WWPN and/or one or more iSCSI initiator IQNs. Host groups represent a collection of one or more Hosts. It's a convince object which allows you to group hosts together so that you can assign storage to the group in a single operation rather than having to assign storage to individual hosts which can take more time. Host groups are especially useful for use with VMware clusters and XenServer resource pools as in such cases all hosts in the group require shared access to the same group of disks. Multiple QuantaStor nodes can be managed as a grid. One node will be assigned to be the primary node. This page was last modified on 24 July 2018, at 12:08. This page has been accessed 209,309 times.